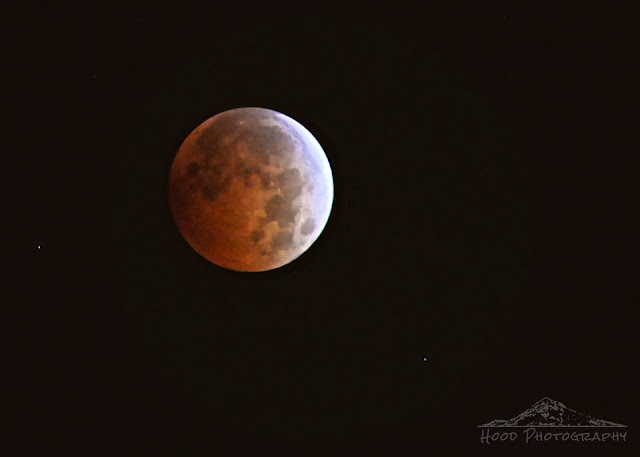 Last night we had the second lunar eclipse of the year. There was also one in April, but the springtime clouds were just too dense to get a really good capture from where I was. This time was different, however, the full eclipse happened at 3:25 AM. I had my night owl husband wake me at 3am, and stayed up about 40 minutes to take this photo. It was worth it. This full moon is also called the Hunters Moon, which is the full moon that happens after the Harvest Moon. Whatever it is technically called, I call it gorgeous! I agree with you. I was lucky to take a similar photo a few years ago. Great luck to see and a beautiful photo. I second that motion ... Gorgeous it is. I got up to look for it, but we have too many trees and it must have been below the tree line when I went out ... :( But, you took a great shot, I have to say. Congrats! Oh yes i agree with you, it is gorgeous! And thank you for that lovely take, as it was cloudy here in our part of the world. Yours is the 2nd moon i saw from Outdoor Wednesday linkers. Thank you for getting up and taking this photograph of the Red Moon. I forgot and slept right through it. I'm fighting off a cough and sore throat so perhaps my body needed the extra sleep. Whatever. Your photo is excellent. Masterful photo! Here in the Sonoran Desert, we had overcast skies, so the eclipse was happening behind thick clouds. Oh, this is SO awesome!! Thank you indeed for getting up to take this shot!! Really superb!! Fantastic. I was hoping for this, but have rain and cloud cover. Fantastic is right! Wonderful photography! Awesome capture of the Lunar Eclipse. A beautiful moon! Have a happy weekend! Wow lucky you, you were able to see the lunar eclipse. Here in my area we had rain. Love this photo. I am so jealous - coming home last night there was a super moon and for the life of me, I only managed to photograph a white dot. Big deal! I am determined to pay more attention to when this is going to happen so I can be better prepared - half the trick. Nice shot and definitely worth getting up for. I woke up to cloud cover at 2, 3 & 4 so gave up. Did get the first half in April. Excellent shot!! I think you timed it perfectly. What a great shot! I wish I could have caught the moon.